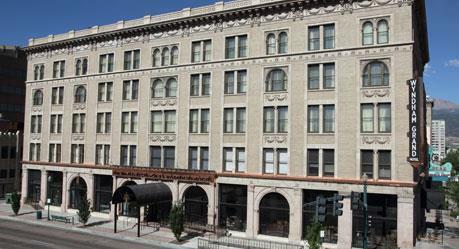 Elegantly combining old-world style with modern amenities and exceptional service, The Mining Exchange, A Wyndham Grand Hotel & Spa is a world-class hotel experience in the heart of beautiful, historic Colorado Springs. Just one hour from Denver in the shadow of Pikes Peak, this hotel is close to breathtaking scenery and outdoor recreation as well as the cultural attractions of Colorado Springs. It also provides easy access to corporate offices, including technology firms and aerospace industries, and three military campuses. Guests will enjoy a state-of-the art fitness center, high-tech business center, and complimentary wireless Internet throughout the property. Onsite restaurant serves all meals and offers 24-hour room service. From boardrooms to ballrooms, the ample, flexible meeting space will suit your needs. Pets are welcome here. Rooms feature soaring 12-foot ceilings, granite work desk, 42-inch flat-screen TV and oversized stone showers with dual showerheads. A big Hercules beetle nicknamed "Herkimer" draws traffic to a museum of bugs. ~9 miles from Colorado Springs. The Buckhorn Exchange has been serving up fleshy chow under the marble-eyed gaze of its mounted kill since 1893. ~63 miles from Colorado Springs.